I am firmly convinced that every homestead needs something to pull trailers or wagons or simply drag things around your property. When you start carrying something any distance you will understand the value of something to pull things. A small utility tractor in the 15HP-30HP range is very nice to have. Not only can you pull just about anything needed in normal homestead activities, but you can also get attachments for it like brush mowers, scrapers or the highly desireable front-end loader. However, this option starts at $2000 for a decads old tractor with an uncertain maintenance record. Another good option is a garden tractor. This is a little bigger than a basic riding mower and will almost always come with a mower deck attached. This has the advantage of being lighter in weight than a utility tractor and will have a much smaller turning radius. Get one of the small dump trailers that are designed to go with it and you have something that you will wonder how you ever got along without it. I have something called an Elec-Track E20 which is an electric garden tractor that was made in the early 70’s and it is by far my favorite for this kind of task. I don’t use the mower that came with it since I have a 52″ ZTR. I have a standard hitch ball so I can move my licensed road trailers around with it. I also have the smaller pin and hole type of attachment so I can pull a garden trailer. Being electric I don’t have to worry about starting the gas engine, keeping fuel in it or the fuel going bad. Since it will mow for about an hour, I can use it for many hours just to haul things around while I’m working. Look around for a riding mower that has problems with the mower deck. You can often pick these up cheap. However, make sure that the motor starts and runs and the transmission and clutch are in good shape. Put some ag type high traction tires on it and you will be surprised what you can pull. If you are working on anything in the 1-5 acres size think about a garden tractor size piece of equipment that you can pull and garden dump trailer around your property. Once you get this kind of setup you will find yourself thinking “Why didn’t I get this years ago”. 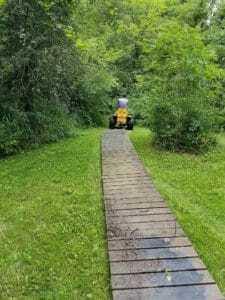 This entry was posted in homesteading, Review, Tractor, Uncategorized and tagged E20. Bookmark the permalink.